Sir Salman Rushdie is back in the news. His book Midnight’s Children set during the 1947 Partition of India has received a Booker award for being the best book to have been booked for a Booker award. Or something like that. Rushdie has also threatened a former Special Branch officer with libel proceedings. The officer was one of of many funded by British taxpayers to protect Rushdie after he received death threats in the late 1980’s arising from his novel The Satanic Verses. That novel offended many for its lewd references to religious Biblical and Koranic figures, including Abraham and the wives of the prophet Muhammad. Jews and Christians were quite restrained in their condemnation of the book. Sadly, a minority of loudmouth Muslims found in the book an excellent excuse to whip up enough hysteria to make their co-religionists into an international laughing stock. The late Ayatollah Khomeini was keen to gain political mileage for his allegedly Islamic revolution by calling for Rushdie to be given a rushed death. This violently imbecilic response from even some Western Muslims was an affront to free speech, including freedom to offend and collectively lampoon religious sentiment. Overnight, Rushdie became a pin-up boy for a loose coalition of free-speech campaigners and sectarian bigots. Some less hysterical Muslims tried to use reason, suggesting this wasn't about free speech, but rather about consistency in UK blasphemy laws that prosecuted persons causing offence to Christianity but not other faiths. The majority of us wondered what all the fuss was about. I was a first year undergraduate when the novel was first published. I found it silly that people who hadn’t read the novel could issue black cheque fatwas. 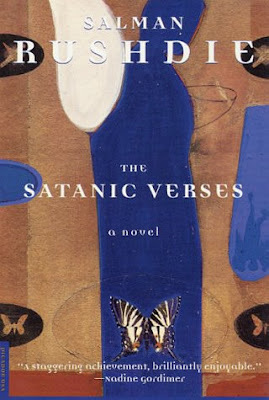 I went to my local library to borrow The Satanic Verses. Within the first 10 pages, I was wondering why hysterical Muslims had turned this literary sleeping tablet into a runaway best seller. Rushdie certainly didn't cause me any offence. But Rushdie lapped up the hysteria, projecting himself as living martyr of free speech. He happily accepted lavish security arrangements offered by his adopted country to save him from violent religious fundamentalists, at a cost to British taxpayers of millions of pounds. Now, some 2 decades on, Rushdie has made his own self an exception to his free speech fundamentalism. And his target? Ironically, one of his very own taxpayer-funded Special Branch bodyguards! One of the officers is about to publish a memoir of his working career On Her Majesty's Service. Part of Roy Evans' memoir deals with the period during which he was assigned to protect Rushdie. The Guardian reports that Rushdie is most unhappy with Evans' portrayal of him as “mean, nasty, tight-fisted, arrogant and extremely unpleasant”. Evans also claims police nicknamed Rushdie as “Scruffy” due to his unkempt appearance , and that Rushdie even charged London police rent for when overnight security was required. Rushdie’s behaviour toward his former bodyguards would hardly inspire Whitney Houston to sing “And I-i-I-i-I will always love yooooooo-iiii-ooooou”. Moreover, it has also left a sour taste on the tongues of that section of his former backers who were inspired by free speech and not just sectarian bigotry. The idea that any kind of free society can be constructed in which people will never be offended or insulted is absurd. So too is the notion that people should have the right to call on the law to defend them against being offended or insulted ... The defence of free speech begins at the point when people say something you can’t stand. If you can’t defend their right to say it, then you don’t believe in free speech. The free-speech fundamentalist of yesteryear is now taken it upon himself to delay the publication of a book because he feels offended and slighted by its description of him. The implication of his position is simple – the law should leave him free to offend the sensitivities of millions, but should protect him from offence. Freedom of speech is a fundamental value to emerge from the violent and bloody historical European struggles that produced the “Enlightenment”. Another is the rule of law. The law does provide remedies to private litigants which impede on free speech. Rushdie is entitled to take action to protect his own reputation, even if it potentially makes him one of this century's great free speech hypocrites. At the conclusion of his address to a recent Big Ideas Forum hosted by the Centre for Independent Studies in Sydney recently, British sociology professor Frank Ferudi declared that there are no free speech heroes in Europe. He said both the Left and the Right were selective in their support of free speech, especially when it came to discussing anything relating to religion. I'm not sure which side of the political divide Rushdie falls into. But his threats against Roy Evans certainly prove that Salman Rushdie is certainly no free speech hero. Irfan Yusuf is a Sydney lawyer and was awarded the 2007 Allen & Unwin Iremonger Award for public affairs writing. An edited version of this article was first published in The Age on Saturday 9 August 2008. There is a fundamental difference between the freedom to write a novel, and the freedom to assassinate someone's character. You are just trying to make a name for yourself. So Salman Rushdie's novels have never assassinated anyone's character. Describing Abraham, the patriarch of ethical monotheism, as a "b#st#rd isn't an act of character assassination. Either that, or Scott believes Rushdie should be free to assassinate the characters of religious figures but no one should have the write to suggest that British taxpayers may have been helping Mr Rushdie pay off his mortgage. Still, Rushdie should never have been the subject of a death threat from any source. Though I certainly won't be looking in Rushdie's direction for advice on free speech and the law.